I’m sure you’ve heard that buyers have more power now than ever before because of all the tools and information at the buyer’s disposal. The maturation of the internet has changed the B2B buying cycle forever. Long gone are the days where buyers relied on salespeople to be their sole education channel. As a marketer or salesperson, how can you use these tools and channels to your advantage? This white paper will give you a road map for how to attract more customers and win more deals in a rapidly changing B2B landscape. First off, let’s make the distinction between B2B buyers and B2C buyers because these businesses differ drastically with respect to approach and transaction values. You could consider B2C “low involvement” and B2B “high involvement“. While B2C buyers may make a purchasing decision the first or second time they come into interaction with a brand, B2B buyers may need several meetings, demos, proposals, and phone calls before making a decision. A B2C buyer may only be making a decision for herself or with her spouse. In a B2B environment, there may be multiple decision makers at several different levels of seniority. Usually, you’ll have to get buy-in from every decision maker before a purchasing decision is made. Whereas consumers have no problem switching from one vendor to the next at the drop of a hat, companies don’t have the same agility. Typically, businesses seek out long relationships with their vendors. For larger businesses, switching vendors can cost a lot of time and money because it causes them to change their internal processes. Unless a consumer is making a large purchase such as a home, car, or college education, most transaction values in a B2C environment are much smaller than B2B. Businesses can typically rack up lots of expenses in multiple areas like salaries, office expenses, insurance, taxes, and marketing. Consumers usually make purchasing decisions on a small number of criteria such as speed, availability, and brand. Businesses can have a much larger set of criteria, including ease of implementation, budget, committee approval, analyst rankings, product features, etc. Today’s B2B buyers rarely act alone. Now, more than ever, B2B buyers don’t make unilateral decisions. Purchasing decisions are oftentimes left up to a group of individuals who all have different roles, levels authority, and pain points. Now, sales reps have to get buy-in from key decision makers before a sale is made. A recent CEB study featured four surveys of over 5,000 stakeholders who were involved in B2B purchasing decisions. In that study, CEB found that an average of 5.4 people are now involved in a B2B purchase. Sales reps should set expectations by finding common ground between stakeholders and aligning their interests with each other. Making sure that shared interests present themselves can lead to much easier consensus down the road. Salespeople can do this through creating data sets and knowledge banks that put everyone on the same baseline. This can be done through the use of an audit or roadmap that is tailored to what the company is trying to solve specifically. Communication with stakeholders should also contain language that is used in and between departments. To incentivize an advocate even further you must get them more emotionally invested in your solution. You can do this through your marketing materials or sales conversations. If you can demonstrate not only how your product solves their problem, but can also give them a “warm, fuzzy feeling”, your advocate will be much more likely to champion your product behind closed doors. Salespeople have to remember that even though they are selling to a specific contact in the company, that their contact usually has to sell the idea internally to get buy-in from other stakeholders. Your prospect does not know your product as well as you and they are usually not salespeople with a skill set that includes persuasion. You must prepare your contacts with materials that can help them gain buy-in from other stakeholders. That may include white papers, blog posts, demos, videos, presentations, or additional training materials. You want to equip your advocates with everything they need to succeed. 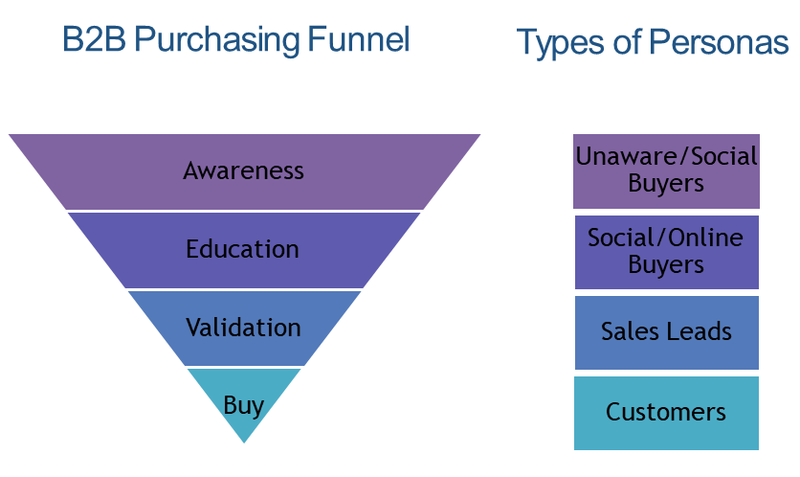 To be competitive in the marketplace and reach all the different buyers in the buying journey, you have to mix up your lead gen channels so you can sell to different personas. These buyers love to socialize and believe strongly in word-of-mouth. They need to know exactly how your product solves their problem or addresses their need. These buyers don’t know their pain points or if there is any solution outside of what they already know. You have to create the demand and educate them on how your product/service can solve their problem. You can reach these type of buyers with outbound marketing tactics like cold calling, cold email campaigns, or inbound strategies like content marketing. Now we’ll look at each stage of the B2B buying cycle to get a better idea of the process B2B buyers go through to make purchasing decisions. At this stage, the buyer realizes that they have a problem but are not actively looking for a solution yet. They may discover more about their problem through social networks and word of mouth. At this stage, you will find unaware people and social guys. In the educational stage, the buyer has defined her problem and is actively researching options to solve it. At this stage of the process, we see social guys and online buyers actively looking for more information on various solutions. They will use Google, social media, talk to their peers, search Amazon, read analyst/expert reports, review a company’s website, read news articles, and more. During this stage, the buyer has recognized their problem and has educated herself on several different solutions. Now, the prospect has engaged one or more of these solutions in a sales conversation to further learn about a specific solution whether that be through setting up a demo, booking a consultation, or sending an email inquiry. Now that you understand the buyer’s journey, we’ll look at how to best approach the prospects at each step of the process. What you have to remember is that everything hinges on the exchange of value. You have to bring someone a lot of value without asking for anything in return to win their attention. It’s best practice to trade value for the attention of the personas. Analytical marketers and salespeople will look at analytics and metrics to crack the attention code but measuring metrics is a short-term approach. You must focus on where your buyers are and what value you can offer to them. No one method works alone. They check reviews, forums, Q&A websites, Google their answers, etc. They know their pain points and they know the solution so basically they compare choices to find the best solution. They jump online and put their question in a search engine, check review websites, ask questions on forum websites, or directly to their solution providers. You can gain their attention by doing SEO, PPC ads, social ads, and by answering questions on Q & A websites like Quora and Reddit. They always check with experts, ask their friends, and think logically before taking any decision. They attend events, webinars, and listen to podcasts to know the root cause of their pain points and how to solve them. This kind of buyer persona is very humanistic. Doing webinars, podcasts, and educational videos can grab their attention. They don’t know their pain points so you have to educate them about a certain problem in their process and give them the solution. They rarely do any research or attend educational events. You have to reach out to them proactively through email, phone calls, content marketing, and other digital platforms. There is no #1 marketing channel. It doesn’t exist. Each has their pros and cons, are more effective with certain buyer personas, and are best deployed at different stages of the buyer’s journey. Buyers may move in and out of personas and back and forth through phases so it’s important to make sure you’re perfecting your communication for all personas, and at each part of the process. The best way to do this is through a multi-channel approach so you can reach all types of B2B buyers at various stages of the buying cycle. Once you start seeing results you should modify and tweak your strategy to take advantage of what’s working best for your particular business.